This spacious, newly finished apartment is conveniently situated in a brand new complex in the heart of the old town of Alpe d’Huez. It is one minutes walk from the ski lift and returning ski piste and has many excellent bars and restaurants in the near vicinity. It is extremely comfortable offering two bedrooms and a spacious living room leading onto a rear terrace at garden level.The master bedroom has a double bed and the second bedroom has been designed as a twin that can be adapted to a triple bedroom. The bathroom has a bath with a shower and there is a separate toilet.The lounge, living and dining area is open plan. It is spacious and practical with a fully equipped kitchen and comfortable lounge with flat screen TV and wifi. The sofa folds out into a double bed. There is a private garage and a ski locker.This apartment is equipped with electric shutters on each window. It has a washing machine and the kitchen has a dishwasher, fridge/freezer, oven, hob, extractor. The bathroom has a full size bath with shower attachment and shower door. 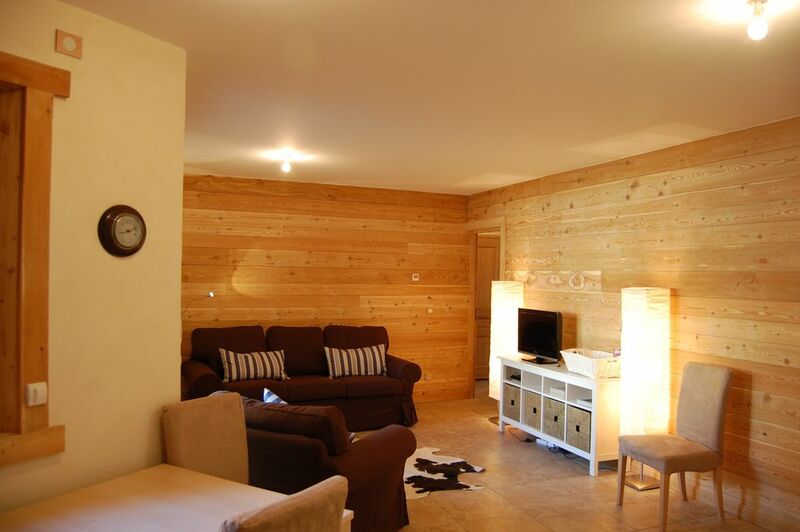 Great weeks skiing from this well equipped and nicely furnished apartment. We were met at the Bens Bus drop off point and taken to the apartment and shown all the facilities with a very warm welcome. Access to the slops is easy and quick by either the telicabin cages leading to the base of the Signal area or two chairs across to the Bergers area. You can ski back to the same point all just 100 metres from the apartment. At the end of a days skiing you can't beat a "Jug" of lager at the "O" Bar just across the road, the atmosphere is great and the cost not bad compared to the other bars. Supermarket is just around the corner and only a little further is the centre of the resort with ice skating, swimming pool, bars, restaurants and shops. Would be very happy to stay here when we revisit the resort. During the summer months Alpe d’Huez is a vibrant place buzzing with life. The wild flowers blanket the green mountains side and everything feels fresh with brilliant colours. The resort is open from the 27th June until the 30th August and there are so many activities to keep you occupied. There are many walking and mountain bike trails and some of the ski lifts are open during this period to facilitate getting around this vast region. The sports centre is open and both swimming pools; the outdoor pool being an excellent sun trap. There is a nine hole golf course and tennis courts, Parks, markets and generally something for everyone. Golf: Alpe d'Huez offers a nine hole golf course. Basking high up on a sunny plateau Alpe d’Huez is situated at an altitude of 1860 m. It is a paradise for all mountain sports enthusiasts offering 238kms of pistes, floodlit skiing, snow parks, half pipes and plenty of thrilling off piste runs. What fun! The ski area is very comprehensive starting around the resort with beginner slopes, all of which have a natural progression to reach the next level of slope; the higher you go the more difficult the runs become. When you reach the highest point, Pic Blanc at 3330m, intermediates can have great fun on the slopes of the glacier or if you are at an advanced level then there's the challenging Tunnel - a steep black mogul run - or the gentler Sarenne - a black run which claims to be the longest in Europe at 16 km. There are five satellite villages to the Alpe D’Huez ski area each with its own style. All areas are well equipped with mountain restaurants offering delicious food. Rates vary depending on the time of the season. Linen and towels are included. A damage deposit of £250 is required.